Why Put Yourself and Your Computer at Risk? We're not trying to frighten you, but you should know the risks you're taking on when you download and watch pirated videos from torrent sites. Downloading pirated videos is really not a good idea – not only is it illegal, but it opens you up to liability since HBO has been tracking down illegal content distributors and it makes your computer vulnerable to all kinds of malware. Just see what Consumer Reports has to say about why it's risky to watch pirated episodes (it's an oldie but still very relevant) . According to a recent study by Kaspersky, many pirated shows contain malware, adware, and trojans capable of hijacking your computer. Game of Thrones episodes were particularly egregiously full of malicious software. PlayOn enables you to download Game of Thrones, The Walking Dead, Supernatural, and other streaming shows legally. It is different than using torrent sites which violates the DMCA (Digit Media Copyright Act). PlayOn is a streaming DVR for downloading streaming videos and it never lets you download content you don't already have access to. 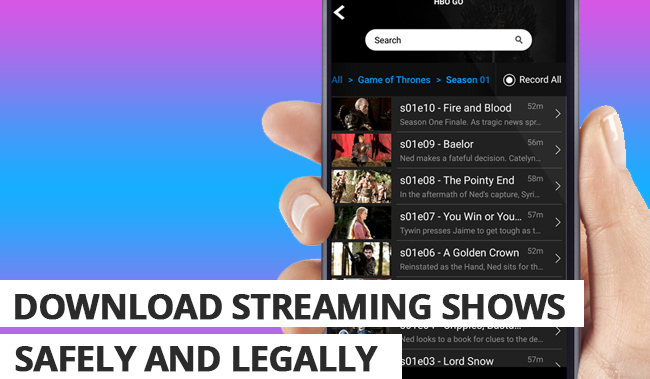 Here’s how: use PlayOn Cloud or PlayOn Desktop to make a legal recording of every episode of your favorite shows with your own credentials and then download your personal recording of Game of Thrones and other shows to your PC/Mac/mobile device to watch anytime, anywhere, even offline. And yes, PlayOn is legal and has been around for many years now. Get PlayOn Cloud for your phone or tablet, you can download it for free from Google Play or the App Store. Then, get the Game of Thrones recording credits pack for PlayOn Cloud for just $12. You'll get 73 recordings — that's enough to record seasons 1-8. All recordings are stored in the cloud for 7 days and you can download them at any time. Each episode recorded in 720p will take up about 1G of disk. Cloud storage is also available to store all the episodes if you need it..
» See instructions on easy it is to make a recording with PlayOn Cloud. You can also download Game of Thrones (or any other streaming show you'd like) with PlayOn Desktop -- the streaming DVR for Windows PCs. How Long Will It Take to Watch Every Episode of Game of Thrones? If you want to know how long it'll take you to watch all 67 episodes of seasons 1-7 after you've recorded and downloaded them all here's a guide. Believe it or not, if you start right now as soon as this blog post is published, you can watch them all before this Sunday's Season 8 premiere — that is, if you don't need to leave your house for any reason before then. Yes, that's a challenge!